BALTIMORE, MARYLAND – Elders of Baltimore, a social media platform that fosters real-life intergenerational connections through storytelling, will officially launch on the evening of July 1, 2016, in time for many family gatherings that will take place during the upcoming national holiday. Baltimoreans of all ages are encouraged to spend time with their elders, ask to hear their stories, and to listen closely. Photos and brief anecdotes or quotes related to these experiences can be submitted to eldersofbaltimore@gmail.com to be considered for publication on the Elders of Baltimore Instagram account, and also in print via local print media. Instagrammers should follow elders.of.baltimore to see all of the wonderful posts! Who are elders? Elders are senior citizens. They are grandmas, grandpas, great aunts and uncles, cousins, friends, and neighbors. They are treasures. Artists Ashley Minner and Sean Scheidt conceived of Elders of Baltimore while working on a related storytelling project, their photo essay The Neighborhood Changed: A Collaboration, featured in the current issue of The Bmore Art Journal of Art + Ideas. In an attempt to piece together a greater narrative of change in East Baltimore over the years, Ashley and Sean collected individual stories from a wide cross-section of residents. They started by interviewing their own elder family members and other elder loved ones. They made Instagram and Facebook posts about this experience which received a lot of attention. They so enjoyed interviewing these elders in particular, and the elders had such a good time sharing their stories, the team since decided to use social media to promote similar interactions across the city. The team pitched their idea for Elders of Baltimore to the Warnock Foundation Baltimore Social Innovation Journal. They were chosen as Spring 2016 Innovators and were funded $1000 seed money to begin the project. Ashley and Sean plan to publish one story per day for the first week after the launch of the account, and at least one story per week thereafter. They will turn administration of the Elders of Baltimore project over to another pair of artists in January 2017. Elders of Baltimore is a social media platform that fosters real-life intergenerational connections through storytelling. Elders of Baltimore seeks to celebrate, honor, and bring recognition to Baltimore’s elder citizens across race, class, and community divides by inspiring personal connections, and existing as a widely accessible public archive of the artifacts of those experiences. 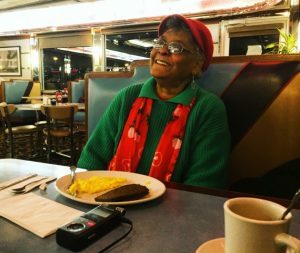 Baltimoreans of all ages are invited to submit photos and brief anecdotes or quotes from their interactions with elders to be considered for publication on the Elders of Baltimore Instagram account and in local print media. Instagrammers should follow elders.of.baltimore to see all of the wonderful posts! Ashley Minner is a community based visual artist from Baltimore, Maryland. She holds a BFA in General Fine Art, an MA and an MFA in Community Art, which she earned at Maryland Institute College of Art (MICA). A member of the Lumbee Tribe of North Carolina, she has been active in the Baltimore Lumbee community for many years, and regularly visits communities throughout the U.S South and Latin America as well. Ashley works with several local and regional arts for social justice organizations including Alternate ROOTS. She coordinates Artists U Baltimore, a grassroots planning and professional development program run by and for artists, under the Greater Baltimore Cultural Alliance. She is currently a PhD in American Studies student at University of Maryland College Park, where she is studying vernacular art as resistance in related communities of the U.S. South and Global South. Ashley is a 2016 Innovative Cultural Advocacy Fellow with the Caribbean Cultural Center African Diaspora Institute (CCCADI) in NY, NY. She is most inspired by the beauty of everyday people. Sean Scheidt is an editorial fashion and portrait photographer based in Baltimore, Maryland. He holds a BA in Visual Arts with an emphasis in Photography from University of Maryland Baltimore County. Known for his nuanced use of lighting and attention to detail, Sean photographs for a variety of clients nationwide. His work can be seen in print magazines, books and advertisements. Sean teaches Studio Lighting at Towson University and sits on the board of the Baltimore Chapter of The American Society of Media Photographers (ASMP). His love of storytelling can be seen in his approach to both commercial and personal work.History, nostalgia and family serve as inspiration no matter what the assignment. The Warnock Foundation believes in supporting social innovations in Baltimore by making direct philanthropic investments, and promoting Baltimore’s great ideas by providing a platform for thought leadership and community building. Their vision is a Baltimore that fully capitalizes on its wealth of history, talent and energy – a Baltimore where all citizens believe we are moving in a positive direction.